The Spider-Man franchise has seen it's ups and downs over time with all of the different game representations. Each one has some redeeming quality, even if they are small ones. Spider-Man Web Of Shadows swings away from the movie license and tends towards the Marvel Universe Spider-Man. Comic fans will get a thrill swinging past some of the locations that are well known in the Spider-Man comics. Stark tower, Wilson Fisk's building to name a couple. Not-So-Friendly Neighborhood Spider-Man – A fusion of web-slinging and powerful combat moves combine to create an unbeatable, all-new fighting system that intuitively blends Spider-Man’s speed and strength with the environment for deadly new attacks and combos. 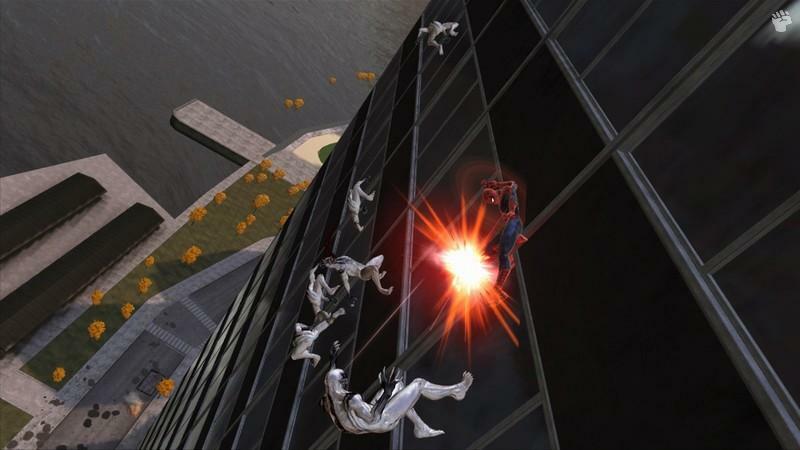 Players can crush an enemy through the momentum of swinging from a flagpole, fight hordes of symbiotes with wall-crawling abilities, or rapidly attack an entire mob in quick succession with the spin of a web. And for the first time in a Spider-Man game, gamers can take the fight vertically and combat foes on city walls, where Spider-Man has the advantage. Anything Goes – At a moment’s notice, players can harness the grace, agility and acrobatics of Spider-Man Red Suit, or leverage the brute, savage power of the Black Suit. For the first time in a Spider-Man game, gamers can switch suits at any time to create devastating never-before-seen combos and finishing moves. Players must decide if saving New York means siding with Marvel’s most honored heroes or its most dangerous villains, as they control how to fight, what abilities to upgrade and with whom to ally. The City That Never Sleeps – Teeming with life, the Big Apple is more alive than ever before in the Spider-Man series. Citizens will either cheer Spider-Man on or run away in fear, depending on gamers’ actions and decisions. 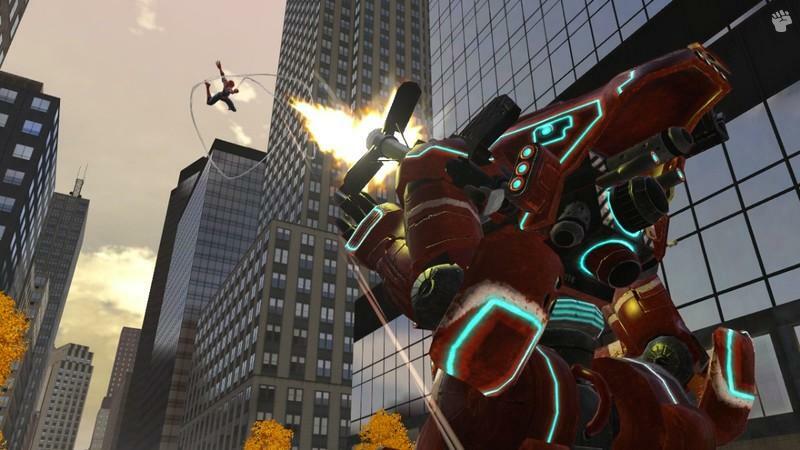 Players control whether Spider-Man acts the hero or the vigilante in his quest to save the city, both in turn affecting the course and struggle against the symbiote invasion. Battlefield: Next-Gen Apocalypse – Increased city interactivity and destructibility allow the player to pick up and use anything in their way as a weapon, destroy store fronts, demolish vehicles, and virtually obliterate city streets with powerful attacks. 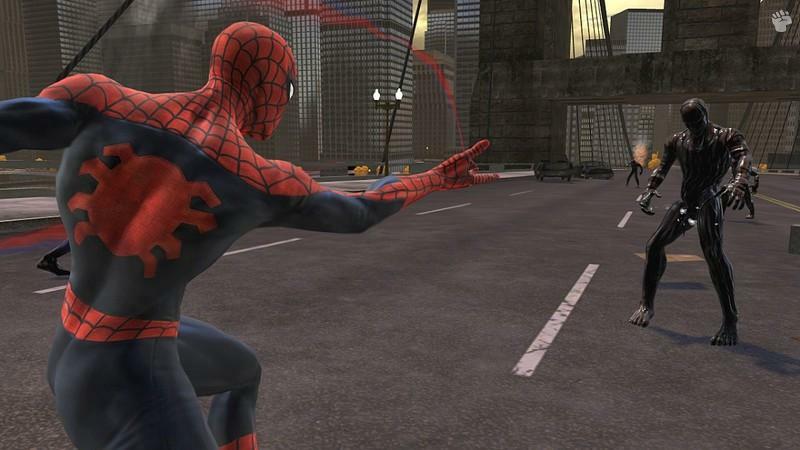 Next-generation technology brings New York to life with realistic textures and animations, as well as an all-new context-sensitive camera system allowing the player to take on enemies and change directions faster than ever before, while adding a new dimension of intelligence and polish to Spider-Man’s actions in the air and on the ground. Who’s With Me? – With some of the greatest heroes and most notorious villains in the Marvel Universe, including staples such as Luke Cage and Vulture, players’ choices control who will ultimately aid them in the fight to rid New York of the alien symbiote. These choices have consequences, as behaving like a hero or like a vigilante will ultimately lead to separate destinies. Extra Credit – As gamers progress, they earn experience in multiple combat disciplines to allow them to custom-design their ideal Spider-Man. Whether players prefer web-slinging to melee fighting, or battling in the Red Suit versus the Black Suit, points are generated that can be used to upgrade the move they like best. Cameos and team ups are the name of the game depending on the paths our hero takes. Such Marvel legends as Luke Cage, and Wolverine are all here as well as some ultra cool villains. I for one am happy to see vulture represented as such a dangerous threat this time around. While it takes place in the Marvel Universe and not from a comic, the story is done in such a way as to not hint at what the time line is to any relation of the comic books, so the story stands on it's own pretty well. The game is a delightfully designed mix of web- swinging, acrobatics and insane combat moves that brings everyones favorite wall crawler to life. This is thanks to a new combat system that really brings Spider-Man's unique acrobatic combat into reality. The story goes that there is some kind of symbiote invasion, the devastating attacks cause chaos to New York City. S.H.I.E.L.D and other heroes are sprinkled through out to lend a hand as well, so it makes for an interesting ride. Especially since some of those same heroes and even villains can become infected with the symbiote and become a totally new kind of threat for Spider-Man to overcome. During game play, you are also able to switch between the black suit and good ol red and blue suit, on the fly. Each suit offers different types of abilities. The black suit is more along the lines of raw power and brute force. While the red and blue suit is more along the lines of speed and acrobatic ability. Going through the game you don't start out with all the cool moves, no sir, like other games in the past as you progress and earn experience, you can custom design Spider-Man to your liking thanks to the multiple combat disciplines. All depending on the suit your wearing. As noted there are some nifty new combat options in Spider-Man Web Of Shadows. This is perhaps the best improvement over all from past Spider-Man games. Not only are there incredible aerial attacks, but some of the web attacks are much more pleasing and seem to be more true to form of the Spider-Man from the comics. Animations over all seem to have been improved, even though it does look a lot like some of the code from Spider-Man 3, In Spider-Man Web Of Shadows the web swinging seems so much smoother. Each Spider-Man game seems to get better and better in many aspects. I am sure all my fellow Impulse Gamers can agree, that this is a good thing. While some of the game play can get repetitive, there is enough going on that it's only a minor diversion. The populace in the game reacts to Spider-Man, depending on how naughty or nice he has been. If he has been leaning more towards the dark suite, Citizens may run for their lives at the site of him. Controls for The Xbox 360, PS3 and PC versions all seem to be pretty solid. Some of the controls like web zipping and wall clinging are a bit different, it takes some getting used to, but you will find your selves doing some ultra Spider-Man moves in no time. I can say that unfortunately button press sequences are back, I was never a big fan of these, not one bit. These take place most of the times near the end of boss fights. So I guess it's not too bad, at least it's not like the hideous over ten different button and stick sequence like Spider-Man 3. So the frustration factor here is minimal if at all for Spider-Man Web Of Shadows, which is more good news. As noted, the graphics are pretty nice, not earth shattering oh my gosh kind of stuff. 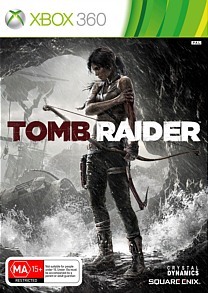 The PC version ran great without any snags on the Alienware system. A Dell PC had some small issues in slowing down when explosions where on screen. PS3 and Xbox 360 both looked pretty darn good. Once in a while there was some inconsistent stupid A.I trying to march forward into a building and not knowing they could not go through it. Sounds are generally pleasing, some sound effects you raise an eye brow at because the quality seems to not be consistent. Voice acting is perhaps a distant after thought in the over all creation of the game. Poor Spider-Man comes off as some one with Batman Dark Knight Envy. The performance is not as consistent as it could be, there are times that the character seems to be reading from the script at a table read, and other times very comfortable with the character. Did I cringe now and again? Yes I did, sorry. Other voice acting is a bit on the Cheese side, this is of course the script and not the actors. 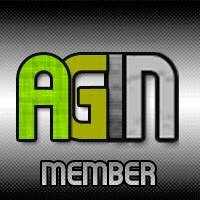 Hey it's all in fun. When the one liners start to fly it starts to seem like a not so bad choice after all. Other characters like Black Cat , Black Widow and others seem to be right at home with who they are portraying. Some of the things I can do with out? One of these days someone will come up with a in game camera system that won't drive someone nuts as they play a game. It tends to throw perspective to a different point at the worst of times. That would not be so bad accept when the camera does not want to change where you want it to, which can cause you to go skittering off in a wrong direction or off a building you where trying to run up the side of. Spider-Man Web Of Shadows does all of the right things very well, while it's minor inconsistent issues hide in the back ground, but do not take too much away from the super hero experience. Only major down side? No free roaming after finishing the game. Not so sure about the re playability, even going full red and blue suit one time and then the black suit the next. 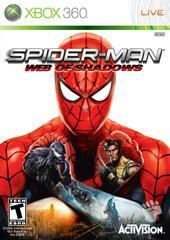 Spider-Man Web Of Shadows is fun, for Spider-Man fans and new comers alike. Getting to do some of the incredible acrobatic spidey moves is well worth the price of admission.